Happy New Year! I hope 2018 is off to a good start and you had a wonderful holiday season. I’m really excited to be getting back to business here on Style Bee and to be sharing my first post as a full-time blogger, EEP! I really appreciate your patience over the holidays while I took some time to be with friends and family and finish up at my previous job. It feels so great to finally be able to put 100% of my focus into this space! While I’ve got lots of ideas in the queue for 2018 I wanted to begin with a wrap up of 2017 before we dive into a new year and closet mission. My general feelings on 2017 and my mindset going into 2018. Where I ended up with my 2017 Closet Mission goals. My favourite looks from 2017 and personal style themes. The most worn additions to my closet (and those that didn’t see much daylight). So grab hot drink, a comfy seat and get cozy for a long one! Overall 2017 was a wonderful year. Dave and I got married and went on the most wonderful trip together. My nephew Owen was born. We finally finished work on our home. My blog reached the point of becoming a viable business and means of employment. I built on some incredible friendships with my longtime girlfriends and met some amazing new women. The 10×10 community expanded and I connected with a ton of fabulous folks and discovered new makers from all over the globe. All-in-all it was definitely my best year yet! That being said, if I had to assign one word to the entirety of 2017 it would be ‘distracted’. I felt like my focus was constantly being pulled in several directions and I was never able to give any one thing my full attention. I have always prided myself on being a multi-tasker and while I usually find it invigorating to juggle projects, I must admit that by the end of this year I was just completely drained. I’d spent too long feeling as though I wasn’t doing anything all that well and as a perfectionist to the core, it was really weighing on me. Bottom-line being that, in general, I was burned out. Hence, the lengthy break from the blog and the near radio-silence on social media. But instead of beating myself up about it (or forcing myself to engage) I chose to embrace the quiet time and spend the holidays tuned-in to my friends and family instead of trying to ‘share’ what I was doing. It was so nice to just be present and not feel any sort of unnecessary distraction. The result of this down-time was that I was able to reboot and get my head on straight again. In doing so I also realized that I truly missed my online community, building content for the blog and being creative in general. I was worried I would have to force it more than I wanted but the truth is I just needed a break to be able to return to it with renewed excitement and energy. Going into 2018 I’m making an effort to be more cognizant of when I’m feeling drained and unfocused and to do something about it before it takes over! I’ve also carved out some time in my routine for proper self-care (something I scoffed at for years), which I’ll expand on more soon. 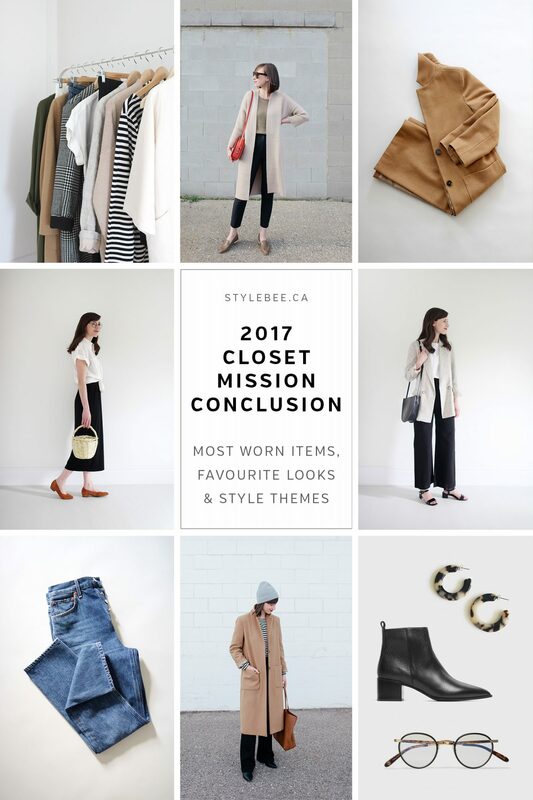 I started preparing this post by re-reading my 2017 Closet Mission, which was a much-needed reminder of where I was at this time last year. I was feeling lost and somewhat directionless in the blogging world and while there are still unknowns I feel a lot clearer about where I’m heading this year. PHEW! Exploring personal style and how fashion can have a purpose in our lives other than just stylish outfits. Connecting to people through this space whether it’s readers, fellow bloggers or designers. Imparting the things I’ve learned, discovered and enjoy in meaningful and visually inspiring ways. Those three ‘loves’ are still at the core of why I’ve decided to give this space my full attention. I’m so glad I chose to push ahead and trust my instincts at the beginning of last year or I might not even be writing this post! For me this was a reminder that just because the path might not be crystal clear, doesn’t mean you’re on the wrong one. But back to assessing my 2017 Closet Mission. Here are the 5 goals I set a year ago and a letter grade I’ve assigned based on how I feel I delivered on each one. 1 | WORRY LESS ABOUT THE NUMBERS | Grade: B- | In 2016 I was really fixated on total numbers in my wardrobe. While that was a good approach to keep my closet lean it was also a stressor and led to my letting go of things to get to a number rather than trying to make them work. In 2017 I definitely didn’t do that as much but I still got bogged down by the idea of having a double-digit closet count (rather than a triple digit one, which I still have). Generally, it felt much better to curate (and clean out) my closet more organically and less restrictively but I do need to remember that responsible style is less about the numbers and more about thoughtful choices and appreciating what you already have. 2 | SUPPORT CANADIAN BRANDS | Grade: A- | I was thrilled to discover, collaborate with and test out some new (to me) Canadian brands throughout 2017. That said, ‘A-‘ felt fair because I do feel as though I could make a better effort to showcase Canadian talent even more on Style Bee. I’ll endeavor to do just that in 2018! Some of my favourites are listed below and I look forward to re-connecting with them and discovering more designers this year. If you’ve got a favourite that’s not on the list, please share them! 3 | CONTINUE TO SHOP RESPONSIBLY | Grade: A+ | Since making the switch to responsible style, independent brands and slow fashion in general, I’ve never looked back! Of course, I appreciate the fact that I’m in a unique position when it comes to adding responsibly made items to my closet, in that I’m able to add more than I would were I not a style blogger. That said, this platform has really helped me connect my readers with responsible options because I can be the guinea pig, for lack of a better term. I’ve received countless messages from people who’ve found brands and pieces they adore and would never have considered otherwise, which feels awesome! Going forward I plan to share more affordable options and branch out into more categories (like activewear and home goods etc.) and I can’t wait to keep making waves in the world of responsible style! 4 | REMIX / REMIX / REMIX | Grade: B+ | I feel like I remixed my closet more than ever before but I could definitely push myself further. I LOVE styling pieces lots of different ways, even if I wouldn’t necessarily wear something so many ways, it gives people ideas that they can apply to their own closet. So I’ll definitely be continuing to remix more and more this year. 5 | SHOP EVEN LESS | Grade: C | I’ve definitely shopped a lot less, but again, I’m a fashion blogger so I’m in a position to add pieces via partnerships etc. that I might have otherwise wanted to buy but couldn’t necessarily afford to purchase were I not an influencer. Balancing a lean closet with a growing blog is no easy feat and sometimes I let it slide too far to the ‘more’ end of the spectrum. That said, I’ve been working on ways in which I can collaborate with brands and share new collections without necessarily always adding lots of new pieces. Taking my blog business on full-time will mean tightening my budget considerably and I’m excited to share the process with you as I deliberate over additions and make even more carefully considered choices. I’m also looking for ways to get responsible style into the hands of more of my readers, so stay tuned! All in all, I feel pretty good about how my 2017 Closet Mission went. I would have liked to blog more consistently and share more remixed looks, styling tips and closet building posts etc. but it came down to time, which was always scarce. Now that I’m all-in, I’ll be able to follow through on my plans better and share more consistently but I’ll save the rest of my thoughts for my 2018 Closet Mission, which goes live on Friday! Going into the 2017 my personal style definition was CLEAN, CONSIDERED & VERSATILE and I think that applies pretty well to all these looks. It’s fun to see how the definition I set out with manifested in so many different ways. If you are interested in creating your own, feel free to check out my 5 STEP STYLE DEFINITION process! Honestly though, the most important takeaway for me is recalling how I felt in these looks. In fact, this might be the first year ever that I felt entirely true to myself in every single one of these outfits. I was also physically very comfortable and emotionally confident about how I was presenting myself to the world. It’s really reassuring to see that every year my closet mission brings me closer to reaching my ultimate goal of closet contentment. Finally, I’ll say that 2017 was the year I felt more at ease when it came to personal style than ever before. WOOHOO! Based on those looks here’s a basic breakdown of my overall colour palette. I’ll be keeping this palette in mind going forward when I’m considering any new pieces. This section is not intended to read as a closet ‘haul’ but rather as an indicator of what I successfully added to my wardrobe. I’ve had several requests for an amalgamated list of my 2017 closet additions and after compiling these I can see that it’s a very useful exercise. It really helps to identify the pieces that have earned their place (and those that haven’t). Plus, seeing all my ‘new’ favourites together gives me lots of new outfit ideas! I could have easily added more items to this list but I felt like I should only mention the ones that instantly came to mind when I was recalling my go-tos. Of course, the weather had a lot to do with what I could wear, hence the lack of very summery pieces and prominence of outer layers. I might also note that no dresses made the ‘most worn’ cut this year but the Ida Shirt Dress was a close contender. Most of these clothes were bought personally while a few were gifted so perhaps that’s an indicator that when I personally invest in items I tend to wear them more often. Or maybe it’s just a coincidence because the opposite seems to be true for accessories and shoes. Either way, these are the pieces I added and wore A LOT this year. I’ve shared links to shop and a brief note on each piece below. 1 | BOXY SHELL TANK | c/o EILEEN FISHER | This is hands down my favourite simple base layer for whenever I go out. It’s slinky and relaxed but tucks in and layers so easily under blazers, sweaters and coats. I love the high neckline, straight hem and cropped length. 2 | LINEN FLORENCE PANT | ELIZABETH SUZANN | I have been a Florence Pant addict for years now and bought the ivory linen version (with a matching Petra crop) for my city hall signing with Dave. They ended up being my go-to pants all throughout July and August. 3 | VINTAGE HOUNDSTOOTH COAT* | FRANCES MAY | I was on the lookout for an oversize houndstooth coat last winter and when I saw this one pop up I had to grab it. It was perfect for our UK honeymoon and I wore it all the time this Fall. It’s one of those timeless styles that can make jeans and a t-shirt look totally chic. 4 | CATT TEE | c/o TRADLANDS | Judge all you want but I have this tee in every colour and LOVE it! It’s basically the only cotton tee I reach for anymore. It’s thick enough that I don’t need to worry about which bra I wear and just boxy enough to feel relaxed. It’s very well made and the perfect casual base to layer and tuck in. 5 | LONG-SLEEVE STRIPE TEE | EMERSON FRY | I have a few striped tees in my closet but I’ve got to give this one the top spot because it’s the perfect black and white stripe and the rayon/cotton blend is insanely comfortable. It’s a bit on the long side but it’s drapey and magical and I wear it at least once a week. I look forward to trying more pieces from this zero-waste line. 6 | RIB CARDIGAN | HAN STARNES via GARMENTORY | Get $20 OFF when you sign up here. | Hands down most beautiful knitwear item I own (except for my Capote Coat) but it’s also ridiculously functional. So soft, so warm, so easy to pair with any base. I wear it in the office most days and under my oversize coats when I’m going out. It’s been my #1 go-to sweater this year. 7 | BOYFRIEND JEANS | EVERLANE | I will say these jeans don’t fit 100% right but I still wear them all the time. I should have exchanged them for a 26 but I have the 27 and had the waist taken in. The denim is suuuuper soft and I love the straight leg silhouette and cropped length with boots. 8 | OLIVE DUSTER* | ALI GOLDEN | This is perhaps one of the most bold items in my closet being that it’s a long, green, silk coat but despite being such a stand-out piece I find it works with almost everything! I love the length, the functional pockets and the flowy fabric. PS: The Baronne Duster was a very close contender for this spot. Since I bought this one personally I gave it preference. 9 | CROPPED MOCK-NECK SWEATER | EVERLANE | I treated myself to this ivory little gem last Fall and it’s been on major repeat all Winter so far. For some reason I’m drawn to light colours in the Winter too. It is so soft, cozy and simple. The boxy shape is great over skinny jeans and the flouncy cashmere has lovely movement. It’s the second sweater I have in this style from Everlane and they are perfect for the winter months. 10 | KAMM PANTS | JESSE KAMM | Technically I got these in late 2016 but they were still one of my most reached for pants this year. 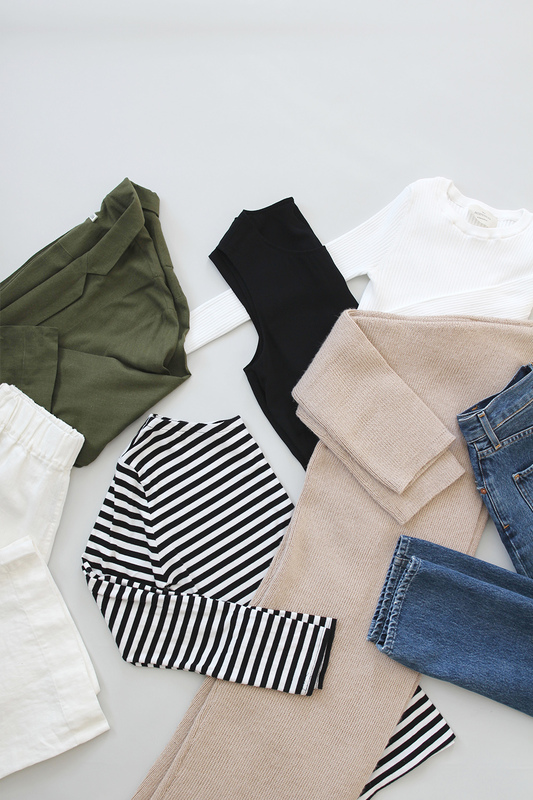 Kamms are both iconic and oh-so-fun to wear! Yes, they’re a major investment, but none of the imitations I’ve tried even come close to the real thing. There’s definitely a reason Jesse has been making this style for over a decade and that she has developed a devoted cult following. 11 | CAMEL COAT* | MARVIN BROWNE | I picked this coat up on our honeymoon in London and it was an instant favourite. I love the oversize fit because it makes wearing blazers and bulkier sweaters so easy and the minimal design is timelessly chic. It’s my secret weapon for taking a simple look and making it special. Plus, I’m gently reminded of my honeymoon with every wear and that’s nice. 12 | RIBBED BODYSUITS | BODYSUIT OF BARCELONA | I am a huge bodysuit fan and after lusting over this line for most of the year I ordered two suits during a free shipping sale. They are officially my favourite bodysuits to date and they’ve been on weekly rotation all winter. They’re a perfect base layer thanks to the super stretchy, soft, ribbed knit, which is also very easy to care for! 13 | THE WAYWARD SHIRT | c/o POWER OF MY PEOPLE | Ah, this shirt makes me think of warmer days and I can’t wait until I can wear it again! It’s one of the most versatile pieces in my closet and I loved it so much that I bought the philosopher version too. Stay tuned for a restock this Spring. 14 | RILEY CROP JEANS | AGOLDE | To say these jeans were game-changers for my closet is an understatement. They’re easily my most worn pants of 2017 and I only bought them about half-way through. I feel like a million bucks when I wear them and always get asked where they’re from. I love the ultra high waist and straight leg cut, not to mention the thick, vintage style denim. ShopBop has them in all sizes right now. 15 | LINEN BLAZER* | REFORMATION | As you likely know, I’m a bit of a blazer-holic. I went a little (okay a lot) overboard on my blazer additions this year but I wear them all the time. This flax linen one was my first addition and I’ve got to say Reformation has really nailed the ‘boyfriend’ fit on these. 1 | MARGOT BAG | c/o THE STOWE | My friend Molly (The Stowe founder) spoiled me with this beautiful bag and it was the perfect way to add some colour and interest to my Fall closet. I was surprised by how well it works within my colour palette and how functional it’s been in terms of carrying all my essentials. The only bag I reach for more is my ELOISE which I’ve had for a few years now. 2 | THE BOSS BOOT | c/o EVERLANE | I was so pleasantly surprised by these gorgeous boots. Not only are they totally stylish but they’re also extremely comfortable and beautifully made. After just a few wears they started to surpass all my other black boot options and I just couldn’t stop wearing them this Fall. I’ve been wearing them this Winter when it’s not too snowy as well. If you’ve been considering them, I highly recommend! 3 | ORB NECKLACE* | YOUNG FRANKK via GARMENTORY | $20 OFF when you sign up here. | Young Frankk has been one of my favourite jewelry lines for years. I find that every piece holds its own in my accessory collection and this one is the perfect minimal statement to add interest to a simple look. It’s got a nice weight to it and the length is perfect for over crewnecks and fitted turtlenecks. 4 | LARGE CIRCLE EARRINGS | c/o MASLO JEWELRY | At first I didn’t think I’d get involved with the statement earring trend but then I had an opportunity to try these and well, I was all wrong, it’s awesome. I’ve worn these bold beauties so much and I especially love how they look with a cropped hairstyle. These were proof that sometimes a trend you think won’t work can turn out to be a personal style booster! 5 | CIRCLE ROPE BAG | c/o APPRVL | Ah, this bag is just so genius! It’s so simple but such a great statement piece. It’s especially awesome because you can wash it and it holds a deceivingly large amount. I’ve yet to wear it without someone asking where I got it. 6 | SUEDE BLOCK HEELS* | L’INTERVALLE | I was so happy to discover this stylish (+ reasonable!) Canadian footwear line. These flats were the footwear all-stars of my Spring closet and I wore them basically non-stop. It’s safe to say the block heel style is one I won’t be giving up on for a while yet either! 7 | SOPHIE SANDAL* | MARYAM NASSIR ZADEH via SSENSE | These were a 30th b-day treat to myself and they became my go-to dressy sandal all summer long. They’re such a simple classic style and they go with essentially every imaginable outfit in my closet. They’re really beautifully made and super comfortable for walking and wearing all day. 8 | WILSON FRAMES | GARRETT LEIGHT | Closet MVP right here! I wear these glasses every day, without fail. Before this pair I always had an adversarial relationship with my specs and felt like I had to adapt my style to suit the glasses, whereas, this pair works with almost everything in my closet. They’re also extremely comfortable and have survived about a zillion falls without a scratch. My advice when it comes to eyewear? Invest in a really well made, classic style you can wear forever. 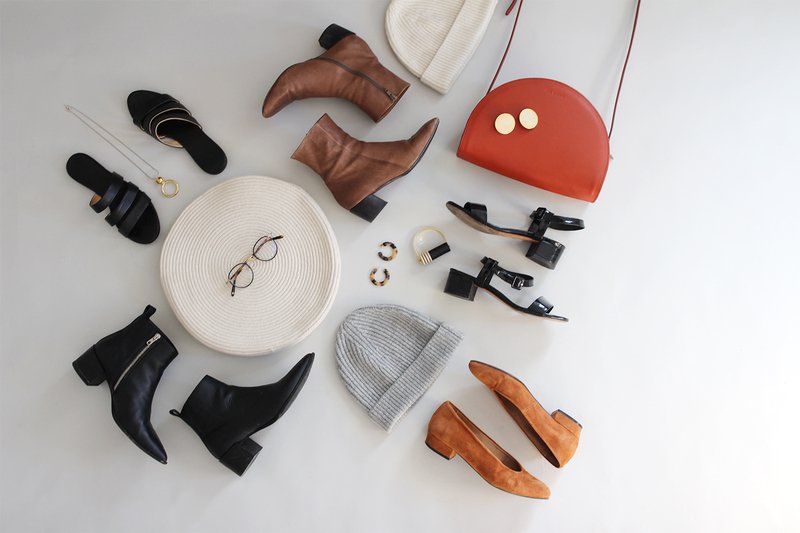 9 | BEANIES | EVERLANE | As I mentioned in my Winter Accessories post, these beanies are totally essential to my life during the colder months. So comfy, so cozy, so good! I’m actually wearing one as I type this right now. They’re sold out (at least on the Canadian site) but I’m sure they’ll be back for next year. 10 | BRACELET* | c/o MASLO JEWELRY | This is my grab-and-go bracelet whenever I need to add a jolt of fun to finish a look. It’s got some stretch which makes it really comfy and easy to wear over sweater sleeves too. 11 | CALLY BOOTS | c/o COCLICO | Also available via GARMENTORY | $20 OFF when you sign up here. | Okay, so if you’ve made it this far in the post you’re awesome and honestly, so are these boots. They’ve been on two continents with me already and I’m not exaggerating when I say they’ve seen daily step counts of 30,000. So well made, so comfortable and the design is perfect for tucking into cropped pants. Can’t recommend these enough if you’re up for a footwear investment. 12 | KATE TORTOISE HOOPS | MACHETE | Also available via GARMENTORY | $20 OFF when you sign up here. | So the circle hoops were my gateway drug to the statement earring trend and I found myself ordering these on Black Friday. Then I basically wore them non-stop all holiday season and they’re so light I’ve often forgotten they were on. BTW Machete is the newest hottest thing in the indie jewelry market, in case you’re on the hunt for some retro tortoise vibes! 13 | CAMILLA SLIDE SANDAL | NISOLO on sale! | Available via GARMENTORY | $20 OFF when you sign up here. | I almost forgot to include these sandals but they were so great this summer! I love the ultra minimal design, the leather is super soft and the sole has a little padding to make them very wearable. Although right now it’s hard to believe I’ll ever be able to go out without giant socks and boots on ever again. 1 | WIDE BRIM HATS | For some reason I just didn’t reach for my wide brim hats all that much this year. Beanies just felt more convenient and when it gets super cold or windy they’re the only practical option. I still love my hats and haven’t let any of them go so I’ll see how they do this year. 2 | SHORTS | I have a few pairs of shorts that I like but this summer wasn’t very hot here in Ontario so I usually just opted for my linen Florence Pants instead. Plus, no need to shave or apply self-tanner when you’re wearing pants! 3 | CLOGS | You guys, I love clogs, but I’ve found they kind of kill my lower back when I wear them for any real length of time. I still have an old pair by No.6 and they don’t hurt me so much but the pairs I got from BRYR had to go to new homes in the end. They’re so beautiful but for some reason just not right for me. 4 | SHORT FITTED JACKETS | I have two classic fitted jackets that collected dust this year. One is a leather jacket from Madewell and the other is a washed denim jacket from Rag & Bone. Both are ‘closet essentials’ but I find I opt for my dusters and oversize coats way more. We’ll see if they get more use this year! 5 | COLOURS OUTSIDE THE PALETTE | I gave a few colours I don’t normally wear a try this year like Lavender, Floral Prints, Blue-Grey and even though I really like them, if they don’t work with a lot of options I just don’t find I reach for them all that much. I should note that the pieces were part of collaborations so I might not have otherwise bought them myself. Well friends, that’s my 2017 Closet Mission and personal style in a nutshell. I’d love to know what you took away from 2017 in terms of favourite pieces and style themes. What were your favourite looks or items to wear and more importantly, why? What are your style findings from 2017? Please feel free to let me know in the comments. I’m excited to share my 2018 Closet Mission on the blog this Friday! Oh wow. I just discovered your blog and am so excited. I’m looking forward to digging around and getting inspired. I love that you have goals and have come back to tell us how it all went. 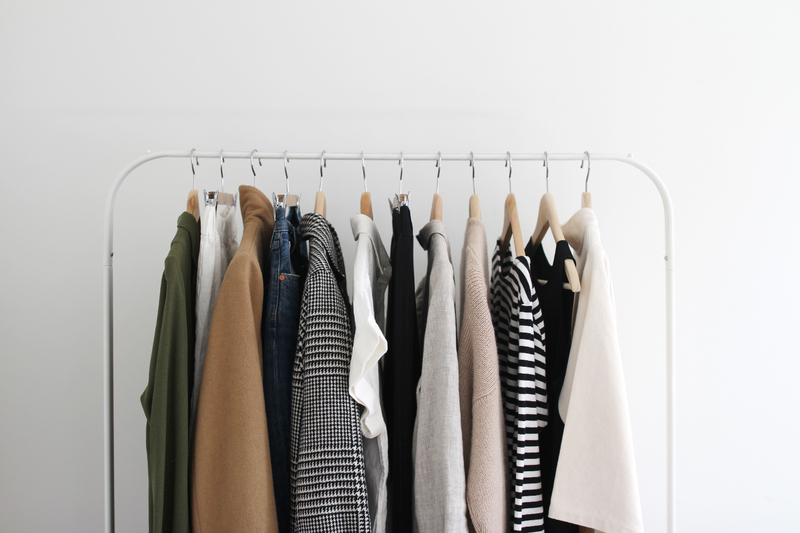 I’ve dabbled in the capsule wardrobe idea dn am pleased that you said that you don’t want to get bogged down in numbers but more in waht works for you. Here in Australia its high summer and its extremely hot which basically means a dress and not much else. I love winter dressing but don’t get the opportunity to really wear those clothes much. I’ve had my style and colours done years ago but I’ve become a bit frumpy and need to get back on board with a bit of style. Thanks for the motivation. Off to clean out my wardrobe. Love your blog! 🙂 Just wanted to add a Canadian company to your list, Dish and Duer. I love their jeans. I can only afford one or two pairs at a time, but they are heaven!!! And their flagship store is in Vancouver (right across the street from my favorite fabric store!). I am across the border in WA, literally 20 minutes across. So I have been a couple of times. Their jeans hold their shape perfectly, but have a great amount of stretch, and are high waisted enough to keep all my mom bulges in :). They also have a special wicking technology so they keep the sweat down in the wrong areas, if you know what I mean! You are supposed to be able to wear them hiking and such too, I just wear them to chase kids though. The only problem I have had, since I wear them probably 4-5 times a week is that the thighs give out in about 6 months. But they are worth it. I love reading your posts! I don’t follow many blogs (honestly) because I get pretty bored by then, but I always find myself reading yours beginning to end! I understand your statement that you are wondering about direction and don’t want to be confined to one specific category of ethical fashion blogging. But, as a reader, your self-reflection, honesty, search for clarity, and humor cause your content areas to be read as unique and so unlike many other blogs I have read! Hard to put my finger on what it is. Just feels true! Anyway, I obviously don’t know you personally, but I feel like your character comes through, and that adds so much more spice and special process to the content areas you choose! I, myself, am I closet personal style lover. 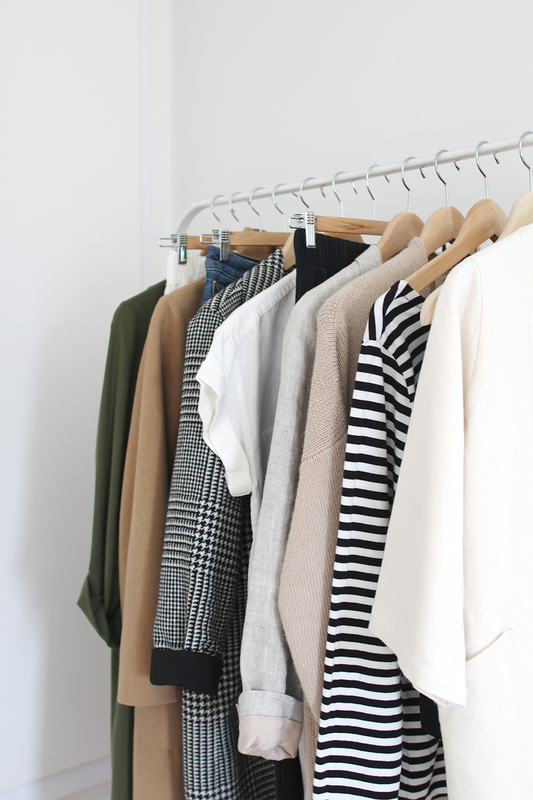 I love editing and (erm…attempting to perfect) my closet. If my budget allowed, I’d love to add more! Alas, my husband and I are planning a big move this year, so I’m tightening the purse strings for a while (the part of me that yearns for Eliz Suzanne items will just have to play pretend a littttle bit longer). Anyway, part of me has always filed personal style away as a “guilty pleasure,” and nervous to share with others how much I think about it or wish to express myself creatively through it! Your blog inspires me to be more open with others about this side of myself. Thanks a million. Looking forward to reading about your 2018 closet mission! Hi! I just wanted to say I loved your holiday Etsy post and got a wallet for my husband through a link (Apogee). He’s been very happy with it. I’d be interested in maybe seeing some more things like that. I love your style aesthetic! So excited to see more posts this year. I would love to see some responsible options that I might be able to actually afford. In theory I love the idea of investing in some quality pieces that are ethically made (especially if made in Canada so that I don’t have to worry about paying exchange rates!) But most of the things I’ve seen on your blog are sadly far out of the range of what I could afford realistically. I mean $200+ for a single top is not even possible for our family budget. Also with two small kids my clothes have to be practical since they take a beating! I would find it hard to have a really small wardrobe of really expensive items! These two reasons make it really hard for me to give up my reliance on Old Navy/Gap staples. However, I do love the remix idea! How to make more outfits from what one already has, is I find, the most fascinating part of style blogs for me. Have you tried Everlane? They may not be quite as ethical, but the look and prices are very similar to Gap, and they are certainly more ethical than Gap. I would say to try them out, maybe do some thrifting, and then buy a couple more expensive, special things to round it out! If you have an Instagram, try the noihsaf.bazaar account. It is a resale page where people send in items they are trying to sell. I see a lot of good deals on pieces that are otherwise out of my price range. Also, the blog Style This Life is from a mom on a budget, so I would check her out! thank you Alissa! Those are good tips…I’ll check them out. Being in Canada makes it a little tougher (and sadly more expensive with the exchange). Also I am six feet tall with long legs! So often ordering online is tough for me unless there is a great exchange/return policy (or specifically tall sizes). But thanks! I am a new reader. I love your minimalist style. I have some more flamboyant tendancies and have a strong sense of color. I would love to file my personal colors into a palette like the one you show; can you guide me to a program as to how you made yours? 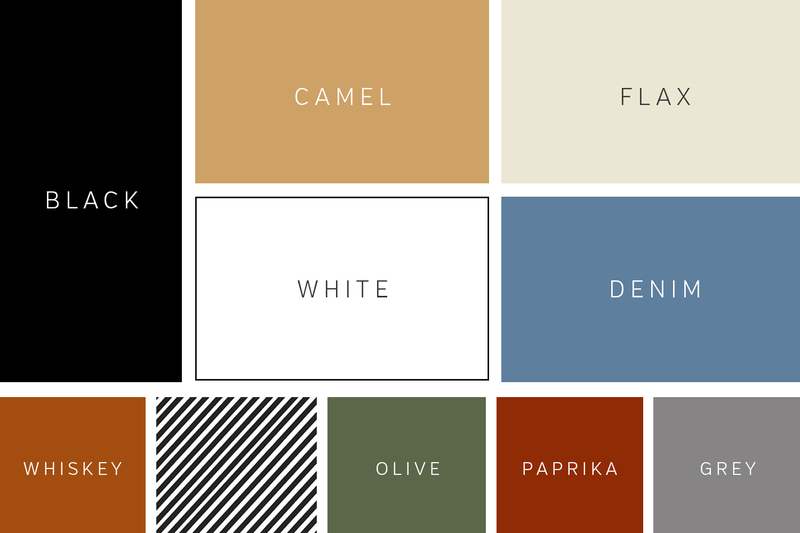 I have googled color palette generators but they all seem to take the tack of generating the colors for you. I *know* which colors I love, but I have never filed them together to really appreciate how they work together. I just want to drag and drop my colors into an existing format. Thanks in advance! I’ve done it in PowerPoint – it was easy and quick. Congrats, Lee! I second what everyone else has already said. You are inspiring and so glad you went for it and are doing this full time. Travel uniform – Black clydes, EZ linen crop petra top or stripe t shirt w/ jean or black linen jacket on top for travel (with white supergas). No 6 dresses – the best. Fav new addition? fun, sparklying socks.. a trend I picked up in Paris. They can make an outfit:) Oh and my coclico glove boots.. love them tucked in jeans. AFAR are so nice too! Hope that helps and look foward to following along. Thanks for all of your tips! Aw thanks for your sweet note, Lee! Well I like your taste too so it makes following along so much fun:) I’ll be sure to share my fav closet finds with you in 2018! First of all, welcome back! I am so excited your posts will be back in my inbox regularly. Second, I love this thorough reflection and it has given me some new things to consider when I think about my wardrobe. It sounds like 2017 was a great year and I hope 2018 holds more of the same! Congrats on an amazing year of growth and learning! …aaaand may I ask: what size do you take in the Catt Tee? Congratulations on getting married, and going full-time with your blog! You have been such an inspiration to my own style journey through 2016-17 and I can’t wait to see what you do in 2018. I hope a winter/spring 10×10 will be arriving again this year! Thank you for this wonderfully thorough post! Loved your wrap up of 2017. I too, tended to scoff at self-care, until I realized it included sleep! Eager to hear you share more on this subject. Blondo makes great waterproof leather boots. I found my first pair at Nordstrom and ordered the others online. They are not cheap but so comfy and I stand all day at work. So excited that you’ll be doing this blog full-time, Lee! And this is such a great post to start the New Year. Can’t wait for your 2018 Closet Mission on Friday. Reading your posts is always so inspiring to me – afterward, I feel newly excited about my wardrobe and the confidence that style can bring! Thanks. A big takeaway from 2017 for me was just general acceptance that loving clothes is okay, and not necessarily silly or frivolous. I find that fashion is such a great portal into community–when we talk about what we wear, we’re usually talking about things we did and how we felt, so it can be very intimate. By allowing myself to blog more “guilt-free,” I’ve made such awesome internet friends. 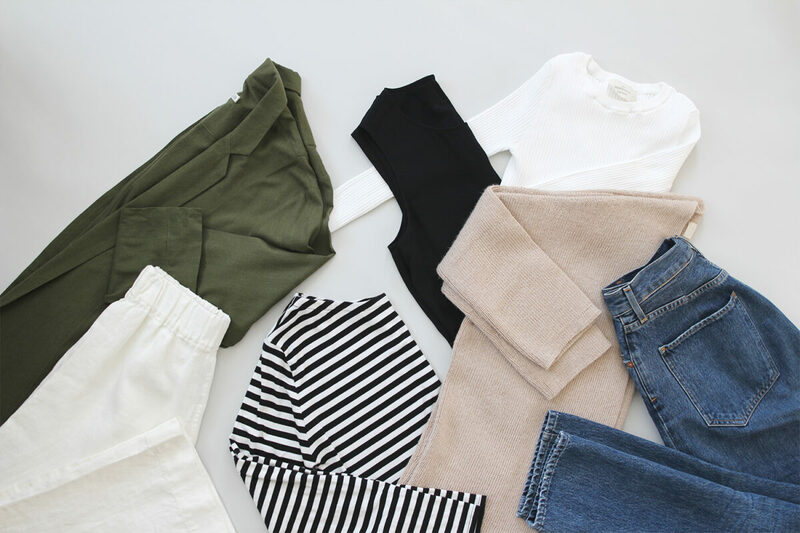 This post is wonderful, and I’m saving your most-worn clothing list as a capsule/packing inspiration template, because all those pieces would work so well together! Glad to see you back Lee, and glad to hear that you got some much needed time away to refresh and breathe. In these first few months of the year I’m really trying to save money (I’d like to establish an emergency fund as well as a travel fund) and I’m trying to approach it as enjoying what I already have. This started in November and December and I never really set a spending ban, but I also haven’t really felt any urges, so that’s nice. 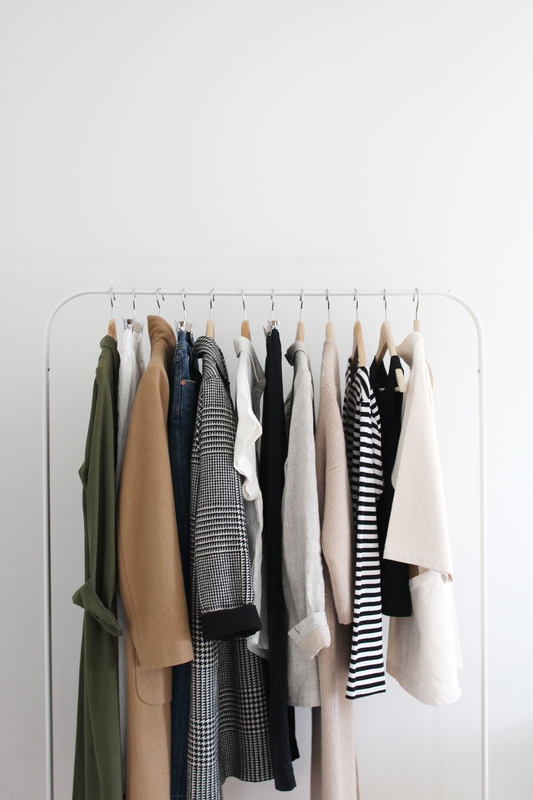 Excited to see what you do with your closet and life (cause it’s not all about the closet!) in this next year. 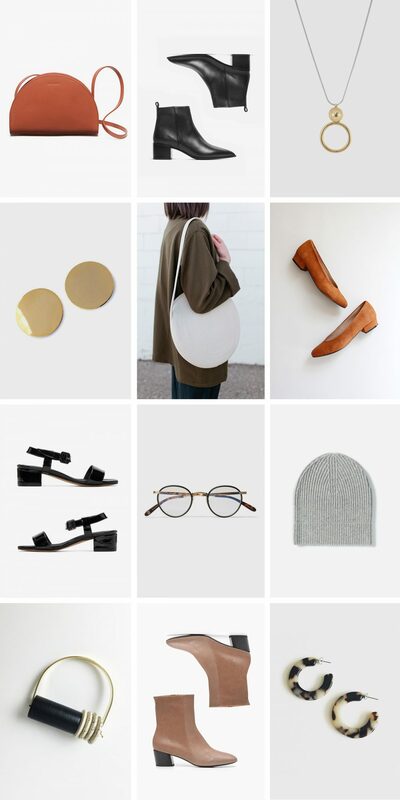 I’m an enthusiastic new reader, and new to the conscious/ethical fashion movement. I’m glad you mentioned something about how your new budget will blend with your clothing purchases. I think that, as a recovering fast-fashion addict, it’s so hard to stomach that these conscious clothing prices are actually what clothes cost to make. We are so conditioned towards fast fashion prices – ethical buys take budgeting, consideration and time. I’m looking forward to posts about how you weigh your closet’s needs against your new slightly tighter budget. Thanks Katherine! Welcome 🙂 So glad you’re interested in a more conscious closet. The fast-fashion conditioning is non-trivial and I know it’s a major hurdle for a lot of people. Glad you’re interested in posts on the topic. Would you consider sharing a photo from your city hall signing? I’m dying to see that ivory linen Elizabeth Suzann outfit! Great post-I’m so glad you’re back! Do you plan on doing a no-shopping January again this year? I’m trying to and would love to follow along. Thanks so much Kat! I really appreciate your support over the years! Love this so much, and I really love your goal of exploring more Canadian brands!! I am devoted to ethical brands but the one thing I struggle with is that so many are based out of the states and further away, and with shipping/duty/currency conversion it can become super expensive. Also, if things don’t fit quite right, it’s way harder to eclxchange! That’s why it’s great to hear of more ethical Canadian brands!!! Thank you for doing this round-up! I definitely saved a few looks of yours and find myself coming back to them when I am looking to introduce a new shape to my wardrobe (i.e. relaxed fit jeans or blazers). One thing I think would be really interesting is if you took the “radical transparency” approach (ala Everlane) and shared a little bit about how you’re paid as a Influencer/Blogger now that you’re full time. I think it would be really helpful to understand how to budget for ethical clothing — i.e. I am a teacher (7th year in my profession) and make about $50,000/year. What are some ways I can think about budgeting for sustainable fashion without feeling like I can only buy 4 things a year? Just a thought! Super happy to have you full time!